Argiope aurantia. 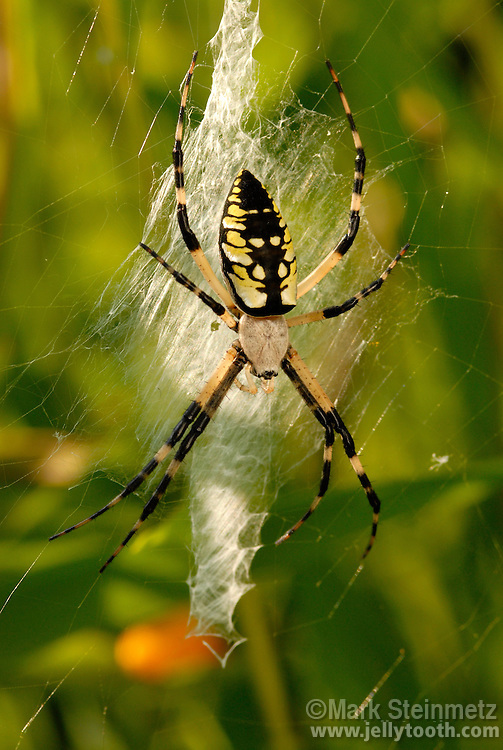 This spider species is known by many common names, including Black and Yellow Garden Spider, Golden Garden Spider, Writing Spider, Black and Yellow Argiope, etc. Common in North America. The mature female of the species has striking markings of black, yellow, and white, and is quite larger than the male. Total body length approximately 2.5 cm. Though the spider uses venom to subdue prey, they are not particularly aggressive or dangerous to humans. Habitats include fields and gardens.